To copy a DVD-9 movie to an ISO image file on hard disk with Any DVD Shrink, follow the steps below. 1. Insert the DVD-9 movie to a DVD drive. 2. Run Any DVD Shrink, click Open DVD button, then Any DVD Shrink will list all the contents of the DVD-9 movie in the main window. And Any DVD Shrink will show you whether the DVD movie is NTSC or PAL. Also the longest title will be pointed out. 3. 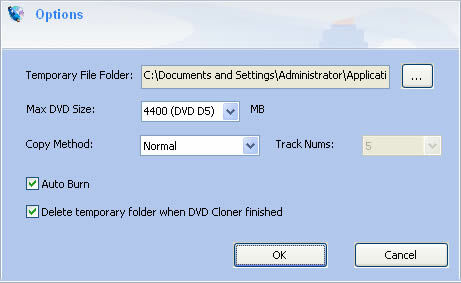 Go to menu Settings --> Options, and select 8000 (DVD D9) in Max DVD Size dropdown list. 6. Click Copy DVD button and Any DVD Shrink will start to convert the DVD-9 movie to an ISO image file. e. Please notice that hard drive in FAT32 format can't hold a file bigger than 4G while NTFS format can. In this case, you may need to convert FAT32 format to NTFS format.